The bottom line: The Dyson V6 Absolute gives you 20 minutes of fade-free suction – and for the average household, that should be enough. Don’t be fooled by other handheld hoovers you’ve had in the past, the Dyson V6 Absolute promises to deliver twice the suction power of other cordless vacuums. It’s often noted for its ability to pick up embedded dust and dirt from carpets, so if you are after a cordless stick vacuum that could genuinely replace your mains-powered vacuum cleaner, this might just what you need. Starting with the technology, it’s clear to see that Dyson have packed an awful lot into a fairly neat and compact device. Thanks to its 2 Tier Radial cyclone technology, the amount of dust that it picks up has been maximised to the point that reviewers say that the performance of the Dyson V6 Absolute is better than some of the mains powered vacuums they’ve had in the past. With 15 cyclones using centrifugal force, microscopic dust particles and even bacteria as small as 0.3 microns can’t escape its clutches – that’s great news for those with dust allergies. If you’re worried about pet hair hooking into your carpet, the Absolute delivers 150% more brush power than the Dyson Animal (funnily enough) and comes with a Dyson engineered tool designed specifically for pet hair removal, so it shouldn’t be a problem. Understandably, there’s a bit of a love/hate relationship with the battery power. Simply put, you know the battery is going to last around 20 mins max on a full charge. If you own a small home that you can zip around quickly, that’s fine. If you have a larger home or prefer to have the vacuum on MAX power, you’ll need to accept that a little and often approach to cleaning may have to suffice as you can only expect to only get around 6 minutes of suction when the V6 Absolute is in high power mode, but what do you expect from a battery powered hoover? If 20 minutes is not enough time to vacuum your household, buying a mains powered vacuum that doesn’t run out of charge might be your best bet. The good news is that the V6 Absolute only takes around 3.5 hours to charge, so you won’t be waiting too long for a reboot. It’s handy to know that the hoover only weighs 2.3kg, so its manoeuvrability is pretty nifty. With a capacity of 0.4L, it doesn’t hold an awful lot of dirt but with the press of a button you can empty the dust into the bin – for most people this isn’t a problem but those with pets and young children may find themselves emptying it frequently – so decide whether that will be an inconvenience. 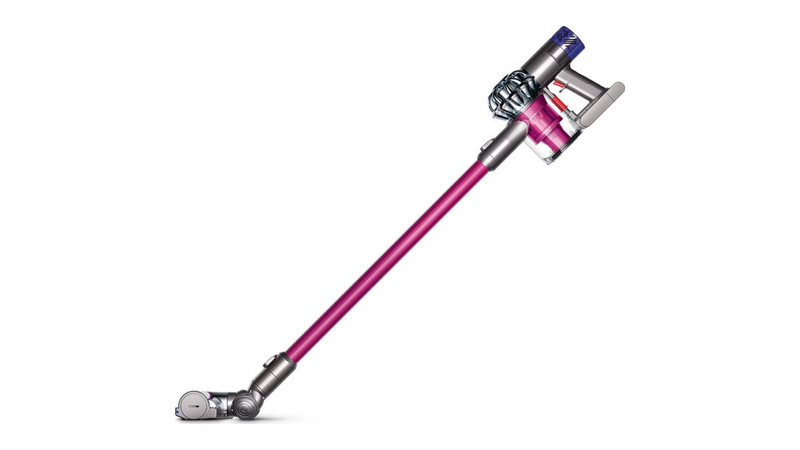 When you buy the Dyson V6 Absolute, you’ll receive a docking station for charging and handy storage, a combination tool, a rigid crevice tool for getting into awkward spaces and a mini motorised tool, which upon removal of the stick, attaches to the motor to form a handy handheld device for cleaning tight spaces. So, if you want a powerful handheld vacuum that gives mains powered alternatives a run for their money, take a look at the best deals above.